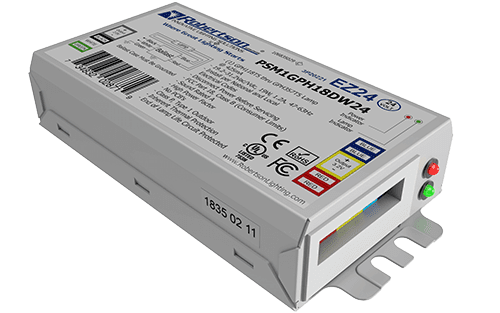 The EZ24 eBallast is our latest generation of innovative ballast technology specifically designed for the highest performance UV applications in the most difficult of operating environments. Correct and consistent UVC output is critical for effective germicidal treatment. The EZ24 easily meets these standards by performing over the widest range of lamps, temperatures, input voltages and lamp cables. Energy efficient and power factor corrected, the EZ24 can work with most existing transformers without limiting critical UVC power. These unique design characteristics allow the EZ24 to perform successfully in the harshest of operating environments. It will reliably start lamps down to 0°F, at a minimum of only 19.2 volts-AC or DC, yet perform in the hottest environments, up to 176°F ambient, for many years. Compare our specifications to that of any other UV ballast to measure the difference. Check out our top performance product line of UV Ballasts for UV Systems via our UV Application brochure. Robertson has been at the forefront of the lighting industry for almost seventy years. We have built a reputation for excellence based on our broad line of reliable and high-quality products, extensive technical expertise, superior customer service and long-standing industry partnerships. We have fully revamped our web portal to provide extensive product characteristic search capabilities that exceed that offered by anyone else in the industry. This allows for extremely quick searches if our current products, its predecessors, by lamp, and/or cross reference to products from numerous other manufacturers. A distributor/commercial end-user site that allows for volume discount pricing, expedited order processing, check order status, view sales history and utilize any of the site's eCommerce functionalities.